Compression garments have been around for centuries and used most prominently for post surgery patients. There's a compression garment for any human body part and some are also being sold for that impatient dieter to help hold in the belly. Most recently athletes have been wearing compression suits to help recover quicker from their workouts. 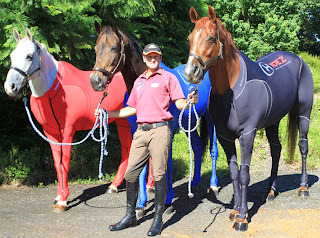 In fact one athlete found compression suits such a great benefit for himself he decided to design a compression suite for his horse. Yes you read right. A compression suit for his horse. Now you and your horse can cool down together in fashion and in a healthy way.